Torre, O.; Escaler, X.; Egusquiza, E.; Dreyer, M.; Farhat, M.
Torre, O. [et al.]. 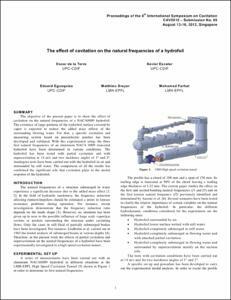 The effect of cavitation on the natural frequencies of a hydrofoil. A: International Symposium on Cavitation. "Proceedings of the 8th International Symposium on Cavitation". Singapore: 2012, p. 1-4.